Shrouded in mystery is Star Wars: The Clone Wars‘ Season 5 finale arc. Recent episodes have very much delivered on the “Who Will Fall?” tagline that Lucasfilm and Cartoon Network have been using the past few months. But though the deaths of Pre Vizsla, Satine, and Savage Opress have been major—even shocking and moving—there’s been a sense that those have just been a prelude to the emotional devastation to come. 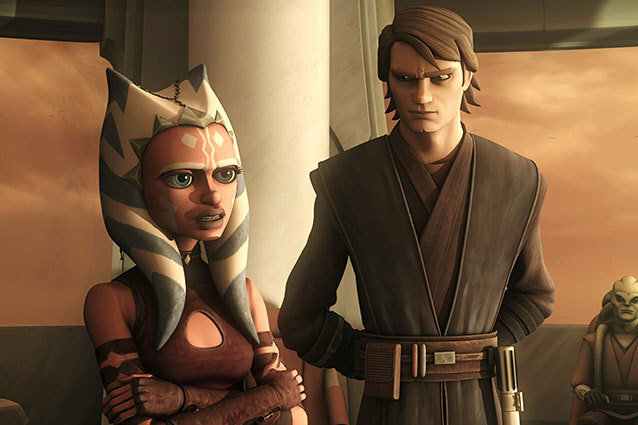 Namely, it’s the feeling among fans of the show that these final episodes will answer the all important unanswered question of The Clone Wars: So what happens to Ahsoka? I haven’t seen the three episodes that follow “Sabotage” yet, so I’ve got no inside information for you, I’m afraid. But based on Ashley Eckstein’s responses during the Clone Wars Google Hangout I co-hosted last weekend, it sounds like something major is about to happen to Anakin’s Padawan. Major enough that these episodes were thought to be even more fitting as season cappers than the truly epic Darth Maul arc that just concluded. “Sabotage” feels like only a tiny fraction of the story to come, an overture to an intense emotional journey. What’s fascinating is that it included a number of story beats that were like mirror image reflections of plot points in Revenge of the Sith…further indication that, whereas that film sealed Anakin’s fate, these episodes will in fact have Ahsoka meet her destiny, whatever it may be. This presentation of the Battle of Cato Neimodia was notable for a couple reasons. First, it’s the debut of the fan-winged Eta-2 Actis starfighter on the Clone Wars TV show! Kind of an intermediate design between the old Delta-7 Aethersprite Jedi Starfighter and the Imperial Era Tie Fighter, with a Sienar-style octagonal viewport, it gets my vote as the most beautiful starfighter design to emerge from the entire period of the Clone Wars. It also confirms what we’ve already been saying. The Eta-2 Actis was only introduced in the last year of the year, meaning that this conflict is headed toward its endgame. No sooner had Ahsoka revived Anakin Master Yoda sent them a message: the Jedi Temple had been bombed. And since the bombing had occurred from within the highly-secure Temple, there is a chance a Jedi could have been responsible for it. Only Jedi who weren’t there when it happened could truly be trusted to investigate the matter. And of course, out of all the Jedi spread out on all of that Galaxy Far, Far Away’s battlefields, Yoda wanted Anakin and Ahsoka to lead the investigation. But to be serious, yes, there had been Jedi who refused to fight in the war, and Jedi who were outright traitors. Other than Dooku and Krell, the Clone Wars TV series hasn’t really addressed them all that much. In the 2003-2006 line of Clone Wars comics, there were many, including Mace Windu’s former lightsaber instructor, Sora Bulq. And Mace Windu’s former Padawan, Depa Billaba, who went all Col. Kurtz while on a mission to Windu’s home planet of Haruun Kal. By the Force, what I would give to see the Clone Wars TV series adapt Matthew Stover’s Shatterpoint for an arc. We can dream, right? The evidence at the temple started to point to a flight-deck engineer named Jackar Bowmani. A flight-deck engineer who happened to be an expert at ordinance and explosives. I mean, they couldn’t find Bowmani—they guy had totally disappeared—so he had to have been the trigger man, right? Oh, well, he could also have been totally vaporized in the blast, since so many had been killed, but no one seemed to think of that until Russo-ISC produced a severed hand that belonged to the accused, and obviously deceased, bomber. Nanodroids of a highly volatile nature were found inside the hand, suggesting that Bowmani himself had been the bomb. Did that mean he had been a suicide bomber? When they brought in his wife, Letta, for questioning, she mentioned how rigorous the psychological profiling was for workers at the Temple. It had been her husband’s dream to work there. He would never set off a bomb there. NEXT: So just what does your average, ordinary Republic citizen think of the Jedi? Outside the Temple a crowd of protesters had gathered. Initially, from the previews of this episode, I had thought we were seeing a generic anti-war crowd who were specifically objecting to the Jedi’s role in managing the fight. But that didn’t seem to be the case here. These actually were relatives of the Temple support staff who had perished in the bombing. They figured that a Jedi must have been responsible for their loved ones’ deaths. Even though many Jedi had died in the blast as well. It does point out just how precariously positioned the Order is at this point. Throughout much of the Republic, and certainly on Coruscant, there doesn’t seem to be a draft. The clones are the cannon fodder used to prosecute the war against the Separatists, and the Jedi lead them. In a sense the war has been privatized. And these clones are mostly fighting droids, not flesh-and-blood insurgents. With a few major exceptions, of course. The fact is, it’s probably hard for most of the Republic’s citizens to really feel like they have a stake in this war, that they have some responsibility for it. They haven’t been asked to sacrifice for it. They’ve got the clones to do the bleeding and dying for them. Their biggest involvement in the conflict comes through one-off traumatic events that occur every now and then, like when Coruscant lost power following the Battle of Sarapin and again later when General Grievous ordered a suicide bombing on the planet’s main power grid. Obviously, if you’re on a planet that gets invaded, that’s the ultimate terror. We can only imagine the chaos that must have engulfed Coruscant during General Grievous’ week-long space battle over the planet that opened Revenge of the Sith. After that, no wonder the citizens of the Republic were practically begging to hand over the keys to the galaxy to Palpatine. The fact is, without being asked to sacrifice much for the war, when these traumatic events happen people in the Republic feel doubly helpless, like they have absolutely no control over the chaos swirling around them. Maybe Palpatine could save them, but that’s it. Certainly not the Jedi, who’ve been fighting a three-year-long conflict with little headway and can’t even safeguard their own Temple. Anakin and Ahsoka decided to take a plunge into the Coruscant underworld to investigate Jackar’s place of residence. Damn, Ahsoka’s “I would have thought working for the Jedi paid better” at seeing their former employee’s lower-city tenement was about as cluelessly obnoxious as Anne Hathaway saying “Yay for dental!” during her SAG Awards speech. Ahsoka’s had it pretty easy, all things considered. Fighting a war may be tough, but putting in a 9 to 5 job to support your family and carve out a place for yourself in the galaxy? That’s a life-long commitment. The pad was pretty squalid, and I half expected to see the chalk outline of a Gungan on the floor, as was originally planned for Cad Bane’s Coruscant apartment way back in Season 2. Ahsoka found some nanodroids in food that was laying about. (Think of the nanodroids like Star Trek’s nanoprobes, except that instead of getting assimilated into the Borg Collective these just blow you up.) That must have been how Jackar ingested them. But did he eat them willingly or by force? Also think of this like Downton Abbey for a moment. Did Mr. Bates feed his wife the poison, or did she take it herself to frame him for her death? Which is to say that I think Letta may in fact be getting set up here. I know, I know, it doesn’t look good for her, and she basically admits that she fed the nanodroids to her husband after she returns to the apartment, then uses some nifty parkour moves in a failed attempt to flee from the Jedi. I mean, she confessed! But isn’t this all a bit too convenient? A bombing happens at the Jedi Temple and the primary suspect, who had nanoprobes his bloodstream, appears to have been totally vaporized in the blast…with only his hand left behind to confirm his death. His oddly-accented, proletarian worker-hatted wife then becomes the immediate suspect. Could it be that Jackar pulled a Peter Pettigrew, cut off his hand, drizzled it with nanodroids, then had someone plant it at the scene of the blast to implicate his wife. Winter’s Bone tells us that cutting off your hand is a Meth Country trick for making the Feds think you’re dead. For all we know Letta could be in on it, and she’s just agreed to take the fall for whatever reason. And from the preview, we definitely know that Letta is murdered in prison next week and Ahsoka takes the blame in a Hitchcockian “wrong man on the run” kind of scenario. This appears to be a massively orchestrated campaign to discredit the Jedi Order, and we’ve so far only seen the tiniest fraction of it. NEXT: This episode was named after a 1936 Alfred Hitchcock film that also features a bombing. What’s the connection here to the Master of Suspense? Hitchcock later said he regretted this scene, because if a sympathetic character is killed so indiscriminately, it results in the audience checking out of the movie. Of course, he would upend that theory altogether with that little matter of Janet Leigh in the shower halfway through Psycho. All this is to say, that if this episode is a true homage to Sabotage, Bowmani probably was a fall guy. I personally would like to think it’s his wife who’s been set-up—hence she’s murdered in the next episode to silence her—but we shall see. NEXT: What will be Ahsoka’s ultimate fate? What’s interesting, though, is that Lucasfilm chose Sabotage as the reference point for this episode and not Hitchcock’s later film made during the war, 1942’s Saboteur, which is one of his classic “wrong man on the run movies.” They obviously just wanted this episode to be an inciting incident for what’s to come. Next week, Ahsoka gets her “wrong Jedi on the run” storyline. That brings me back to how I opened this recap: with the suggestion that “Sabotage” intentionally included several story beats from Revenge of the Sith. If it follows the model of that film, then this is the story of how Ahsoka ultimately leaves the Jedi Order. I don’t think she’s going to turn to the Dark Side. I don’t think she’s going to slaughter younglings. But my theory is that—and mind you, I haven’t seen the follow-up episodes, so I’m totally guessing here—when all is said and done, Ahsoka will actually walk away from the Jedi and the war. The fact that her exit from the Order will be more contemplative, and yes, idealistic, shows how fundamentally different in character and temperament she is, in fact, from Anakin. It’s something I pointed out in my recap of “The Lawless.” The Clone Wars seems interested in incorporating story beats from the movies every now and then—just as the Expanded Universe has. Last week’s episode was full of them. So was “Sabotage.” It’s almost Star Wars’ variation on Nietzsche’s idea of eternal recurrence, the idea that we’re fated to undergo the same experiences over and over again. The Jedi Temple is ransacked and the Jedi themselves are hunted to extinction following Order 66? Well, that’s just like what happened during the Sack of Coruscant in the Great Galactic War 3,600 years earlier. And just like what will happen 130 years later when Darth Krayt’s Sith shatter the Jedi Order on Ossus and almost break the Skywalker line. This galaxy’s history is cyclical more than linear, or to borrow a phrase from another great space opera: “All this has happened before. And all this will happen again.” You could argue that this is just Lucasfilm regurgitating the same plot points over and over again, because of a lack of ideas. But I strongly disagree. I think it paints a portrait of a galaxy in perpetual flux, in which darkness and light ebb and flow and never entirely eclipse one another. Just like there were two atom bombs dropped on Japan, there were two Death Stars. Just like, as much as we think we have evolved, we wage wars based on fears and ambitions not that different from our ancestors thousands of years ago. Where there is sentience, there will be an eternal battle between order and entropy. In galaxies near and far. And on that philosophical note, I leave you, Padawan Readers, until next week, when the plot thickens quite a bit more for Little Miss Tano. See you then!